Some mornings just don’t go right……. 5 men posted on a miserable rainy morning for what was supposed to be a fartlek session. It did not turn out that way. 7 men and 1 mans wife posted for an overdue running of Senator Royal Repeats! 60 degrees, no humidity, it felt like the perfect Fall morning! Who came up with this route? 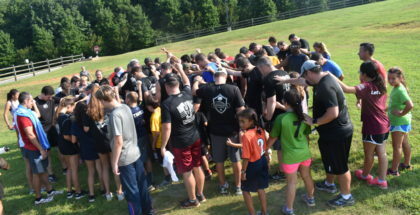 F3 Dads Comanche: Was it 150% humidity or 150+ PaX and Kids? Perhaps both! First of all…. Wow, what a great morning! 150+ (I think 153 or 154) Pax and 2.0s got out of the #Fartsack to have some fun and bonding time this morning! In addition, it felt like 150% humidity! Just a friendly reminder that the F3 Dads workout and breakfast at Comanche will be this Saturday, July 22 starting at 8am with breakfast occurring around 9am. YHC decided as master Q I should sign up to Q a run every now and then at my AO.